ISO 10002:2004 provides guidance on the process of complaints handling related to products within an organization, including planning, design, operation, maintenance and improvement. The complaints-handling process described is suitable for use as one of the processes of an overall quality management system. ISO 10002:2004 is not applicable to disputes referred for resolution outside the organization or for employment-related disputes. It is also intended for use by organizations of all sizes and in all sectors. 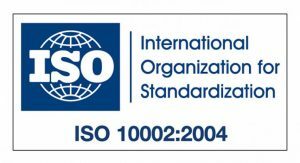 ISO 10002:2004 is not intended to change any rights or obligations provided by applicable statutory or regulatory requirements. We develop and help our clients implement a plan for exploiting those opportunities to achieve financially measurable success.